Located on Rehoboth Avenue, Chesapeake & Maine started as a mere dream of Dogfish Head founder and CEO Sam Calagione. Honoring where he grew up (Maine) and where he now calls home (the Chesapeake area), Chesapeake & Maine came to life as our geographically enamored seafood restaurant! Featuring fresh seafood exclusively from those two regions, our approach to classic seafaring dishes ultimately closes the gap between these two regions of the country … with an off-centered twist. Now, a restaurant that emerged from such a meaningful vision must have some pretty meaningful stories hidden within. And in fact … it does! Almost everything in and around Chesapeake & Maine has a story and a tie to the overall nautical theme of the restaurant. Let’s take a peek inside! Before Chesapeake & Maine, Finbar – an old, authentic Irish pub – stood in its place. While we were excited to put an off-centered spin on a Rehoboth favorite, there were a few charming elements we knew we had to keep. Paying homage to both the past and the future, you can still find Finbar’s original bar – a 100-year-old piece of history straight from Ireland! Behind the bar, you’ll find some awesome hand-painted tap handles by co-work Jeff A. Painted to resemble flags from the nautical alphabet, the tap handles spell out ‘Dogfish’ with a red and a green tap handle on either end to represent port and starboard. Just to the right of the bar, the walls are adorned with portraits of some of the world’s most iconic musicians dressed in their best maritime garb. There’s Billie Holiday, John Coltrane, Miles Davis, Chet Baker, Patsy Cline and of course, Elvis! These great photos were painted by none other than Jon Langford, our good friend from out in Chicago who designed the labels for Immort Ale, Olde School Barleywine, Raison D’Extra, Burton Baton and 75 Minute IPA. 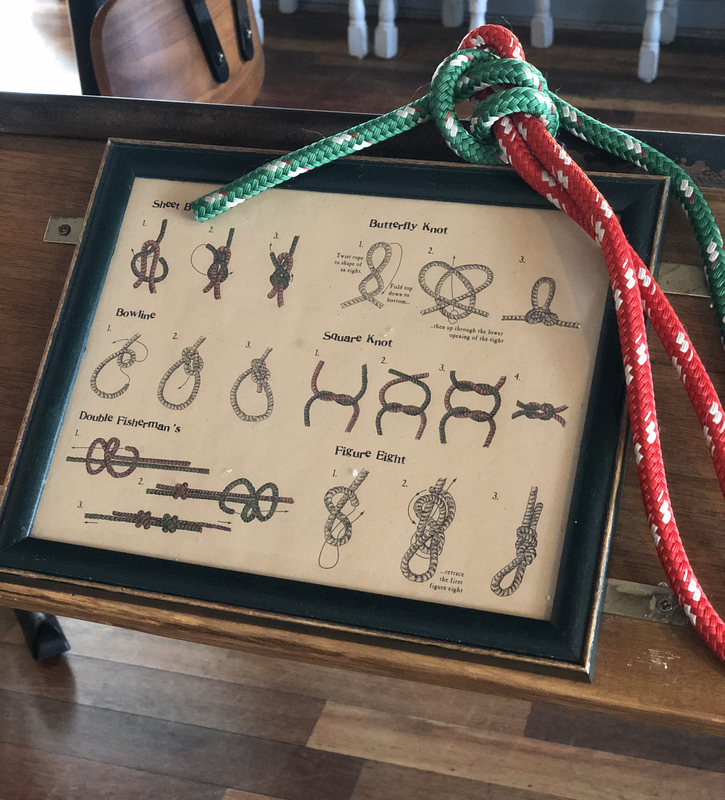 Moving from the bar to just beyond the dining area, we’ve installed some rope-tying stations so you can try your hand at one of six sailors’ knots. The directions are there for you … but, if you’re feeling brave, challenge your friends to a race to find out who has the skills needed to sail the rough seas! 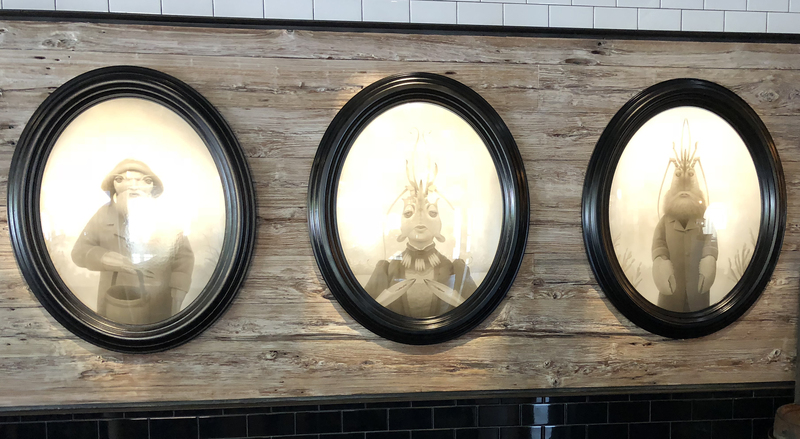 Continuing with our theme of seafaring art, we’ve got what have lovingly been named the ‘Spooky Portraits.’ Commissioned specifically for Chesapeake & Maine, these three portraits were created by Travis Louie. Known for his ability to bring otherworldly characters to life, Sam asked him to create three mythical beings … the ‘mother of the Atlantic’ and her two offspring, one representing the Chesapeake region and one representing Maine. Travel just beyond the ‘Spooky Portraits’ and you’ll come across some beautiful porcelain whales that float just above our raw bar and oyster menu. The whales were sculpted by Cynthia Consentino, an artist from Amherst, Massachusetts. Sam first saw her work at an exhibit during a visit to see his kids at Northfield Mt. Hermon (the same school he and Mariah attended!). He reached out to Cynthia to express his love for her work, and the rest is history! Beyond the whales, our oyster menu has a story of its own too! Custom-made and laser-cut, one side of the menu depicts the coastline of the Chesapeake region, while the other shows Maine’s coastline. Decorating the menu is our ever-changing selection of fresh oysters, which are color-coded based on the region from which they’re sourced. There is one oyster in particular that you can only find here at Chesapeake & Maine though – our ‘Smoke in the Water’ oyster! It’s a culinary smoked, salt-infused oyster we developed with our friends at Hooper’s Island. Next up, our awesome map room! Designed by Tony Millionaire, we dedicated an entire wall of the restaurant to a map-like coast-scape that combines the shores of the Chesapeake and Maine regions. It’s shows of real destinations, as well as fictitious creatures and some fun, made-up locations. Next time you’re here, take a good look … can you spot Chesapeake & Maine on the map? At the back of our map room, we’ve got a beautiful mirror embellished with the Isabella Proximus logo. Sounds like a ship, right? Wrong! It’s a beer we brewed back in 2008 in collaboration with our friends at Russian River, The Lost Abbey, Allagash and Avery. You can still find some bottles of it out there today, but supplies are pretty scarce … so we commemorate this highly sought after brew with this portrait, whose subtitle contains letters from each of the collaborating breweries! While our walls are screaming with stories, you’ll find much of Chesapeake & Maine’s décor is bursting with nautical tales. For instance, the restaurant’s entrance was designed to look like a lobster trap, the building’s windows are meant to resemble portholes on a ship, the chandeliers were created using real oyster shucks, our submariner room was designed to resemble the captain’s quarters on a ship, and the antique Russian deep diver suit displayed in the submariner room was donated to Sam by the restaurant’s interior designer, Josh Otto! Phew! You’ll even find personal touches from past and present co-workers alike. Like the typographical maps of the Maine and Chesapeake regions from Nick B., and the bottle-cap sculptures of a lobster (for Maine) and a crab (for the Chesapeake) that were created by co-worker Wally and given to Sam as a gift for the restaurant’s opening. And did you ever notice that EVERYTHING in Chesapeake & Maine is red and green – the lights, tap handles, signs, even the salt and pepper shakers! In the nautical world, the colors red and green are used to identify the port and starboard sides of a ship. These are just some of the story-ful elements that make Chesapeake & Maine so very special! Stop by and see it all for yourself … you may even find some buried treasure in the form of a hidden story to call your own! We’re now taking reservations! Give us a jingle at 302-226-3600!